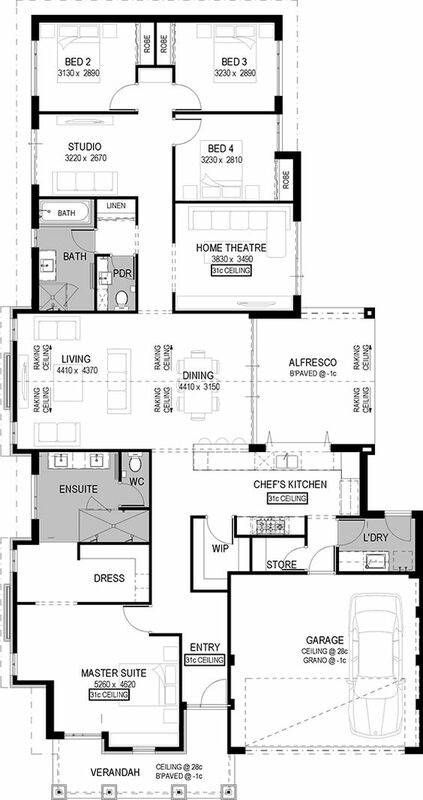 Today I’ve got a big house plan which would sit on most residential blocks. The layout is pretty good on this one. I like the free-form living/dining area with the kitchen that follows through to the alfresco. Make sure you add that raked ceiling because that would be stunning! The bi-fold servery window would be awesome. The storage and laundry from the garage is good too. The master bedroom is HUGE of course. You could have a dressing table, or large mirror and some extra shelving next to the window in the walk-in-robe. The studio could be an office, or a 5th bedroom. If I was using it as an office I’d maybe switch positions for the bathroom and the studio. Unfortunately I can’t fin the exact link for this plan, but it did come from this website (I just can’t see this plan listed).